I couldn’t decide which one I wanted to use, so I’m running a two for one special. 🙂 Happy Hump Day! This entry was posted in Recent Posts and tagged Animals, Art, Couples, Ducks, Friendship, Haiku, Inspiration, Life, Love, Nature, Poetry, Pond Life, Relationships. Bookmark the permalink. You should run a 2-for-1 deal more often. And this one really made me smile-out-loud. Aww. Thank you… maybe I will, Dalo. 😉 Glad to have made you laugh. I like them both! 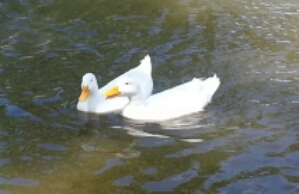 (I think the one duck is going to eat the other duck. Well, see here, the one on the left (if you’re watching them from the back) is waiting for an opportune time. I doubt the one on the right knows what’s what. You should warn him. Or her. We really don’t know. No!! Smiling so much…*laughing so hard* I think the chatty one is nervous and just continues to ramble on about nothing for fear the other might swim away. I enjoy watching the quiet one, he seems so patient. They look to be happy together here. *laughing* Another possibility is that someone chained their feet together. You chained those ducks together? But why?? Soooo, you think I’d want them chained together? I think they would stay quite willingly, actually. See one is smiling and the other swiftly moving them along and listening. And I thought he was hungry. Maybe he’s both. I like the idea of it. Both are beautiful and funny! No possible choice 🙂 – laughing is Life! Thank you for thinking so, my friend. Y’all are far too sweet. No one made a choice. I love to laugh, Frédéric. Oh, you’re no help. T’wasn’t a tough test at all, Christopher. Stop focusing on the ducks and try again. 😉 Ignore the redhead beside you and stop trying to cheat off her, as well. She still doesn’t know which one to choose, you know. Thank you, Michael. Thank you, Michael. 😉 I love it when you laugh.